I enjoy shopping once in a while. I clear my wardrobe and cupboards regularly (you can read my 15 practical, helpful tips to declutter your home) but last year I had a real overdose of consumerism just before Xmas. I know it sounds like a complete cliché and the kind of words of wisdom we find on Pinterest but after the difficult year that 2016 was, I wanted to focus on collecting moments rather than things. I could not rejoice into the pre-Xmas frenzy and the underlying message that happiness was to be found in the latest iPhone or a new it-bag. Have you ever felt like this?? As such my weekly fashion feature “5 Things I Want Right Now!” that many of you loved, started rubbing me the wrong way so I just stopped doing it. It took me 10 months, a blog revamp and some of you telling me you used that feature to get style ideas with things you already had in your wardrobe, to make peace with the idea of doing this feature again. Essentially, it will be a pick of things I’ve seen and which are there to inspire to upgrade, upcycle, swap with friends and sisters, etc. Its dimensions (20.5 cm wide), its embossed star and rectangular shape makes it modern, understated, timeless and practical all at once. It also looks like the kind of bags that French girls would wear and reminds me of the cool A.P.C. shoulder bags. Basically, I can easily see myself wearing it over a trench coat, a chunky Isabel Marant jumper or a simple white tee with a twist. I would pair it with a pair of cropped boyfriend jeans (3) or these frayed Lonnie jeans. Besides the shoulder bag above, one of the new things that could make it to my shelves is this fab grey Amour sweatshirt from Hush AW17 collection. What do you think!? 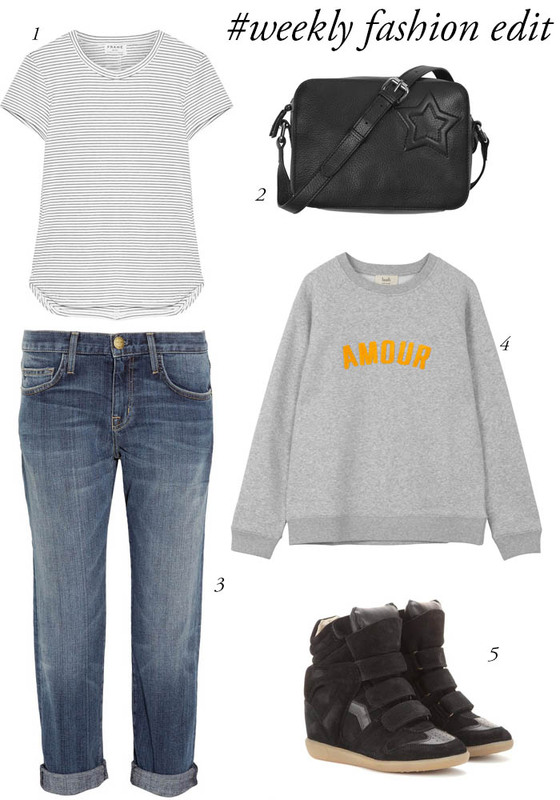 Love them or hate them, the Bekett sneakers by Isabel Marant won’t go out of fashion for a while. I got a pair of grey ones on Ebay four years ago and worn them on a weekly basis for a good three years until last year, when I go fed up. After a year break, I’m pretty sure I will wear them again this winter. The good thing about them (if you havent tried them on yet) is that they are so bulky, they actually make your legs look slimmer. They are also very comfortable and will raise your height by a few cms/inches and let’s be honest….they are a major fashion statement. You can wear a £15 pair of jeans from H&M with them, you will still look fashionable without working hard for it, which at my age, is always a good thing.